Dutch Ton van Genugten and Gerard de Rooy are the Dakar Rally Monday started with a good ranking in the trucks. Race-car driver Bernhard ten Brinke was eighth in the first stage. When the trucks had Genugten, on behalf of Iveco in the leg, about 331 km with a special stage of 84 km, only the Russian Eduard Nikolaev of Kamaz for themselves. He gave 18 seconds to the winner. The third place was for the Argentine Federica Villagra, 53 count admitted. Gerard de Rooy, 31-times stage winner, was in spite of some technical defects fourth at 1 minute and 44 seconds. He rides just like Van Genugten and Villagra for Iveco. Of the other Dutch ended Martin van den Brink (thirteenth), Gert Huzink (fifteenth), Janus van Kasteren (sixteenth), Maurik van den Heuvel (eighteenth) and Gerrit Zuurmond (twentieth) in the top twenty. The 41-year-old Ten Brinke gave on behalf of Toyota with the car’s 3 minutes and 19 seconds to the winner, Nasser Al-Attiyah, who is also Toyota runs. Also, defending champion Carlos Sainz (Mini), Jakub Przygoński (Mini), Vladimir Vasilyev (Toyota), Yazeed Al Rajhi (Mini), Giniel de Villiers (Toyota) and Stéphane Peterhansel (Mini) were faster than Ten Brinke. Ten Brinke said in the run-up to the Dakar Rally that he is ready for the Dakar Rally this year to win. Last year, he was the first Dutchman to the stage in the car’s won in the heavy woestijnrally. The Dakar Rally will be held Tuesday for both the trucks as the cars continue with a stage of about 342 km from Pisco to San Juan de Marcona. The Spanish rider Joan Barreda won the first stage with the engines. The Honda rider had been at the finish line in Pisco, in Peru a lead of more than 1.5 minute on number two Pablo Quintanilla from Chile, who for Husqvarna suits. The American Ricky Brabec ended up on his Honda as the third, nearly three minutes from his winning team mate. Edwin Straver was the first Dutchman on the 54th place. He gave almost 23 minutes on Barreda. The first stage went over a distance of 331 kilometers through the dunes between Lima and Pisco, with a special stage of 84 km. The 41st edition of the famous woestijnrally counted during the award ceremony on Sunday, a total of 541 participants, spread over 334 vehicles. 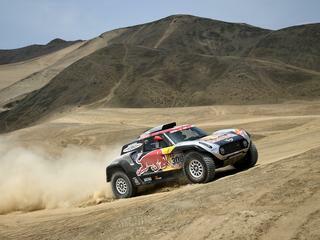 It is the eleventh Dakar in South America. Next week on Thursday to reverse the caravan in the tenth and last stage back in Lima. This coming Saturday is in Arequipa is the only day of rest.